Origin and Habitat: Cylindropuntia echinocarpa is native to the Southwestern United States and Northwestern Mexico, where it can be found the Sonoran Desert, the Mojave Desert, and Colorado Desert in Arizona, California, and Nevada. It can be locally abundant despite its scattered distribution. Altitude range: 50 to 1700 metres above sea level. Habitat and ecology: Cylindropuntia echinocarpa is a common plant in much of the Mojave and Sonoran deserts. It is widespread in a wide variety of habitats comprising desert dry wash, canyons, desert grasslands, and creosote bush scrub, Joshua tree woodland, coastal sage scrub on sand dunes, Pinyon-juniper woodland on sandy, loamy, alluvial to gravelly substrates. Flowering spring (Mar-Jun). It provides important nesting sites for birds. There are no threats to this species. 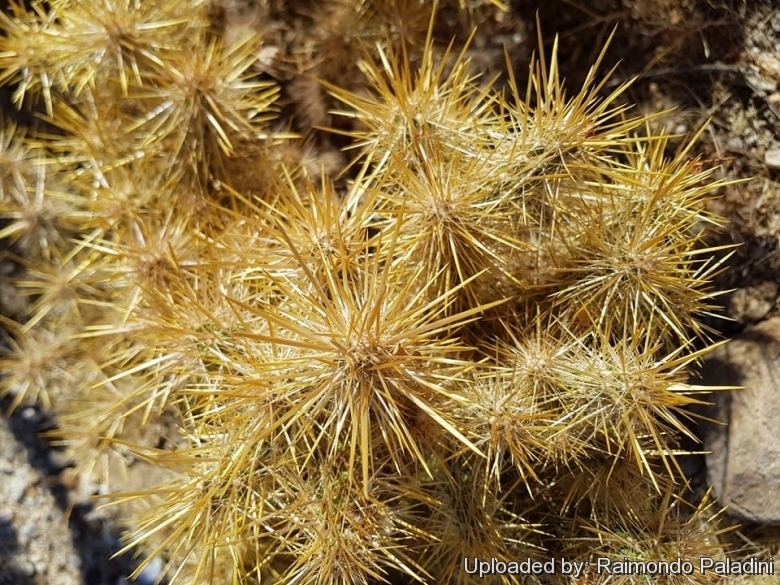 Description: The silver cholla or golden cholla (Cylindropuntia echinocarpa) is a morphologically variable cactus ranging from low, densely branched bushes to tree-like, spreading shrubs to 2 m tall. The plants may produce a distinct trunk-like stem that may account for half of the total height. The stems are densely covered by white, yellow, tan, or occasionally red-brown spines which obscure the epidermis. The flowers are usually greenish yellow, sometimes suffused pinkish or reddish-brownish in the exterior and bloom in the spring; they are more interesting than showy. The fruit is lumpy, spiny, and tan in colour, with white seeds and a foul scent, reminiscent of rancid butter. There are various colour forms and it is sold by nurseries. Distinguishing characteristics: This species has tubercles 1-2 time long than wide and the terminal joints are less than 12 cm long. Derivation of specific name Echino means "prickly" or "spiny" and carpa means "fruit." Stem: 0.5-2 m high much branched. Stem segments usually firmly attached, terminal segments sometimes easily detached, cylindrical, green to light grey-green, 3-7.5(-12) cm long, sometimes as long as 12 cm, and 1-2.5 cm in diameter, with distinct fleshy tubercles 4-13(-15) mm long, moderately broad. The width of the tubercles is less than twice the length, which helps to distinguish it from buckhorn cholla (Cylindropuntia acanthocarpa), which occurs in a similar geographical distribution. Areoles: White, yellow, or tan becoming grey, round to broadly elliptical 4-4.5 × 2-3.5 mm. Glochids: Yellow, very small but conspicuous (3-5 mm long). Spines 6-22 on most areoles, straight, prominent on distal ones, interlaced and obscuring stems, white, greyish, yellowish to brown, sometimes darker, erect to spreading, 2.2-5 cm long, often accompanied by 0-5 bristle-like spines at areole margins obscuring stems, sometimes brushlike. Sheaths range from white below golden yellow aboveand are baggy. Flowers: Light green to yellowish green and sometimes tinged orange, 2-2.3 cm long and somewhat persistent on the fruit. Inner tepals spatulate, 20-23 mm long, emarginate-apiculate. Filaments are greenish-white to yellow, sometimes suffused with bronze or rose, but not red; anthers yellow. The style and stigma lobes are white, cream to light green. Fruits: Becoming dry upon maturation, spherical or obconical to very shallow saucer-shaped with apical flange around deep umbilicus, dry, densely spiny, tan, 1.3-2.3 cm long, 1.1-2 cm in diameter with few large seeds. Areoles 16-24(-36). Very few fruits reach maturity, and many immature fruits can often be seen lying on the ground below. Seeds: Pale yellow, angular to squarish in outline, warped, 4-6 × 3.5-5 mm, sides smooth, each with 2-4 large depressions. Comments: A dwarf form, with narrow terminal stem segments bearing few spines per areole, and one spine longer than the others, occurs on the very arid flats along the lower Colorado River in California and Arizona and has been recognized as Opuntia wigginsii. Although exceptions occur, plants to the north and west in the range tend to be more spiny and to bear yellow to yellow-green flowers. 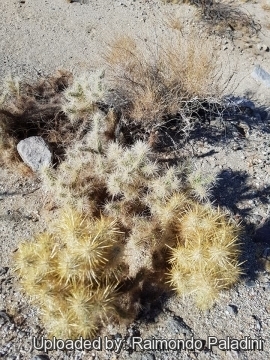 C. echinocarpa has been shown to hybridize with Cylindropuntia acanthocarpa (Cylindropuntia x deserta), Cylindropuntia whipplei, and Cylindropuntia munzii. A single hybrid individual between C. echinocarpa and Cylindropuntia ramosissima has also been found. 2) Pam MacKay, "Mojave Desert Wildflowers", 2nd ed. 3) Engelmann & J. M. Bigelow. "Proceedings of the American Academy of Arts and Sciences" 3: 305 1856. 6) Wikipedia contributors. "Cylindropuntia echinocarpa." Wikipedia, The Free Encyclopedia. Wikipedia, The Free Encyclopedia, 31 Jul. 2017. Web. 11 Dec. 2017. 8) Pinkava, D.J., Baker, M. & Puente, R. 2017. Cylindropuntia echinocarpa. (amended version published in 2013) The IUCN Red List of Threatened Species 2017: e.T152740A121486897. http://dx.doi.org/10.2305/IUCN.UK.2017-3.RLTS.T152740A121486897.en. Downloaded on 11 December 2017. 9) Hunt, D., Taylor, N. and Charles, G. (compilers and editors). 2006. "The New Cactus Lexicon". dh Books, Milborne Port, UK. Cultivation and Propagation: Cylindropuntla echinocarpa is usually found in cultivation in two colour variations. One form has silver spines, the other has golden; therefore the two common names. The abundant spines are arranged neatly on the stems, making both forms highly decorative. The plant is slow to become bushy in colder climates, but in time can be almost half as wide as it is tall. In winter, when it is dormant, it is a nicer looking plant than many of the other cold-climate chollas because its arms do not droop as dramatically as many of the others do. As a whole, this is a very attractive plant and will remain that way year-round [Leo J. Chance 2012].